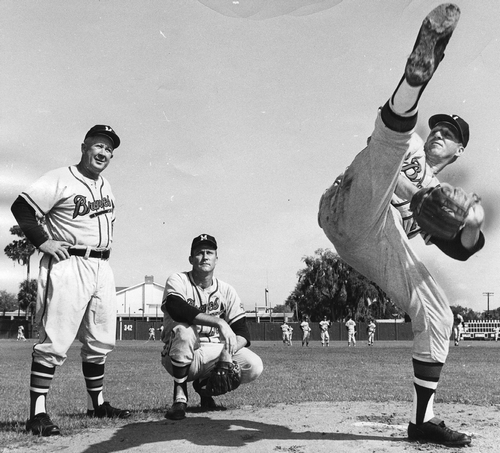 Warren Spahn, the winningest left-handed pitcher in major league history, received a battlefield commission in 1945. Warren E. Spahn was born in Buffalo, New York, on April 23, 1921. He played first base for the Buffalo City Athletic Club and pitched for South Park High School in Buffalo, where he lead the team to a series of resounding victories in 1939 and 1940. The Boston Braves signed the young left-hander for $80 a month in 1940, and assigned him to the Bradford Bees of the Class D PONY League. Despite a a couple of injuries and an uninspiring 5-4 won-loss record he had an ERA of just 2.73. The following year, Spahn posted a 19-6 record and miniscule 1.83 ERA with the Evansville Bees of the Class B Three-I League in 1941, followed by a 17-12 record for the Hartford Bees of the Class A Eastern League in 1942, which was sandwiched between four brief appearances for the Braves. Spahn entered military service on December 3, 1942. He was assigned to Camp Gruber, near Tulsa, Oklahoma, where he learned to be a combat engineer, then served at Camp Chaffee, Arkansas, and pitched for the 1850th Service Unit baseball team. The team’s line-up included catcher Eddie Kearse, future major league pitcher Zeb Eaton, and minor leaguers Ed Sears, Avery Thompson and Elwyn Leatherman. On August 5, 1943, Spahn pitched a 15-0 no-hitter against the KFPW Broadcasters, striking out 17. Only two men reached base – both on errors. He was sent to Europe in December 1944, with the 1159th Engineer Combat Group's 276th Engineer Combat Battalion. "Let me tell you," Spahn said, "that was a tough bunch of guys. We had people that were let out of prison to go into the service. So those were the people I went overseas with, and they were tough and rough and I had to fit that mold." Spahn soon found himself in the heat of battle. "We were surrounded in the Hurtgen Forrest and had to fight our way out of there. Our feet were frozen when we went to sleep and they were frozen when we woke up. We didn't have a bath or change of clothes for weeks." In March 1945, the 276th were responsible for maintaining the traffic flow across the Ludendorff Bridge at Remagen, the only remaining bridge to span the Rhine. The bridge was under almost constant attack from the Germans who were desperate to stop the flow of Allied forces into Germany. At the same time they were to build a 140-foot Double Bailey bridge nearby. On March 16, Spahn was wounded in the foot by shrapnel while working on the Ludendorff. The following day he had just left the Ludendorff when the entire structure collapsed into the river with the loss of more than 30 Army engineers. The 276th received the Distinguished Unit Emblem and for its efforts to keep the bridge operating, while under constant enemy fire, Staff Sergeant Spahn received a Purple Heart and a battlefield commission as a second-lieutenant. After Germany’s surrender in May 1945, newly-promoted First Lieutenant Spahn pitched for the 115th Engineers Group at their base at the University of Heidelberg. In a four-game stretch, he allowed only one run and nine hits while striking out 73 batters. In 1947 he had the first of thirteen 20-win seasons. On September 16, 1960, Spahn pitched the first no-hitter of his career against the Phillies, and the 4-0 win was his 20th of the season. The following year he no-hit the Giants 1-0 on April 28, five days after his 40th birthday. Spahn pitched his last game in the majors for the San Francisco Giants in 1965, aged 44. But that wasn't to be the end of his pro pitching days. He hurled three games for the Mexico City Tigers in 1966, and a further three games for th Pacific Coast League's Tulsa Oilers in 1967, aged 46. Interestingly, Spahn returned to military uniform two decades after the war, albeit under extremely different circumstances. In 1963, he appeared in an episode of the television series, "Combat," dressed as a German soldier! In 1966, Spahn was presented with the Fraternal Order of Eagles' “Major Richard Bong Award” for his WWII service. He was inducted in the Baseball Hall of Fame in 1973. On November 24, 2003, Warren Spahn passed away peacefully at his home in Broken Arrow, Oklahoma. He was 82 years old and is buried at Elmwood Cemetery, Hartshorne, Oklahoma.